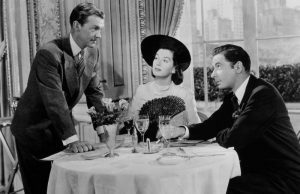 Toronto Film Society presented The Pearl of Death (1944) on Monday, August 20, 2018 in a double bill with The Lodger as part of the Season 71 Summer Series, Programme 6. Production Company: Universal. Producer & Director: Roy William Neill. Screenplay: Bertram Millhauser, based on a story by Sir Arthur Conan Doyle, “The Six Napoleons”. Cinematography: Virgil Miller. Art Director: John B. Goodman, Martin Obzina. Film Editor: Ray Snyder. 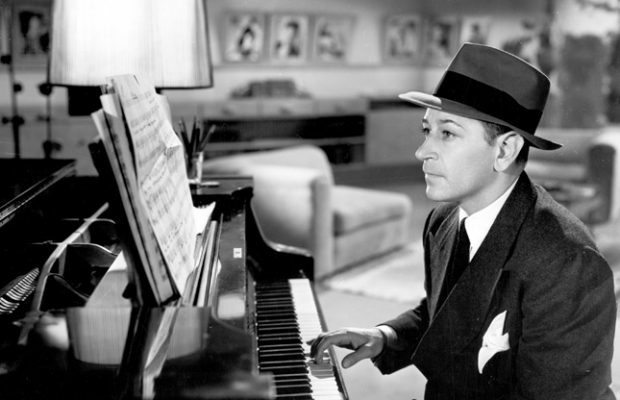 Music: Paul Sawtell. Set Decoration: Russell A. Gausman, E.R. Robinson. Costumes: Vera West. Release Date: August 1, 1944. Cast: Basil Rathbone (Sherlock Holmes), Nigel Bruce (Doctor Watson), Dennis Hoey (Lestrade), Evelyn Ankers (Naomi Drake), Miles Mander (Giles Conover), Ian Wolfe (Amos Hodder), Charles Francis (Digby), Holmes Herbert (James Goodram), Richard Nugent (Bates), Mary Gordon (Mrs. Hudson), Rondo Hatton (“The Creeper”), Billy Bevan (Constable). 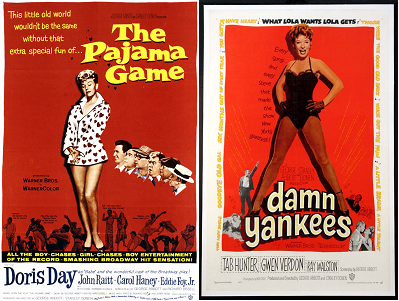 Artwork of course was produced for all films. 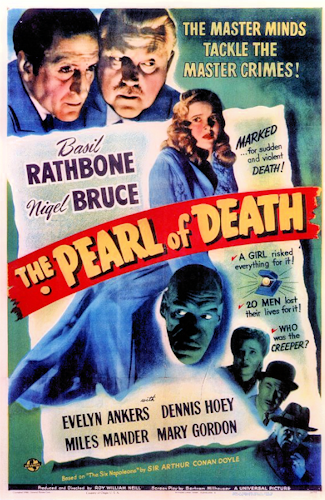 What was notable about the poster for The Pearl of Death was that it was the first in the series that dropped all direct reference to the names Sherlock Holmes and Dr. Watson, instead using the tagline, “The master minds solve the master crimes.” Rather than drawing the filmgoer’s attention to the detective and his aide, the poster instead makes it clear that this is a crime picture, which was never stated before about a Holmes’ film, and that its solution lies in the intellectual deduction and reasoning of its hero. 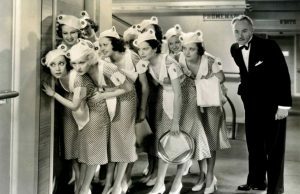 It’s possible that the studio was concerned that if die-hard Rathbone and Bruce fans interest was waning, that a different marketing approach was needed to bring in a wider audience. Other artwork that was featured on the poster was the use of cartoon-like drawings of the pearl itself, with rays of light issuing from it in carefully drawn lines, displaying similarities to pulp-fiction illustrations. This approach was used to signal the film’s appeal to an important B-movie audience, which was a genre heavily comprised of juveniles. 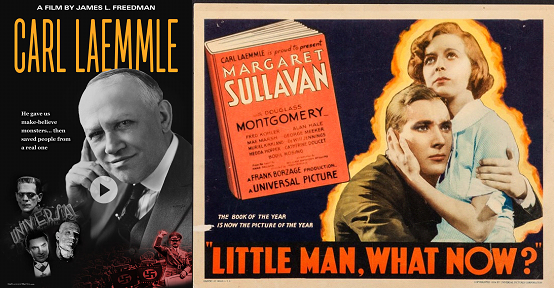 And although the film features a female villain, it is The Creeper who is given prominence on the poster, with a spookily lit, disembodied head. 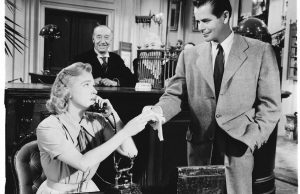 A promotional suggestion by the studio to its exhibitors was that the cinemas construct a strong box, secure with a padlock and place it in the lobby a week before the film was to open. Customers would be dared to look through a peephole at the pearl of death—”at their own risk”—and a still of The Creeper lit up with a green spotlight. Despite the lack of the Holmes name on the posters, the pressbook urged exhibitors to use the name heavily in its promotion, in particular with book-store and radio-show tie-ups, using some form or synonym of the word “detection” in their narrative. 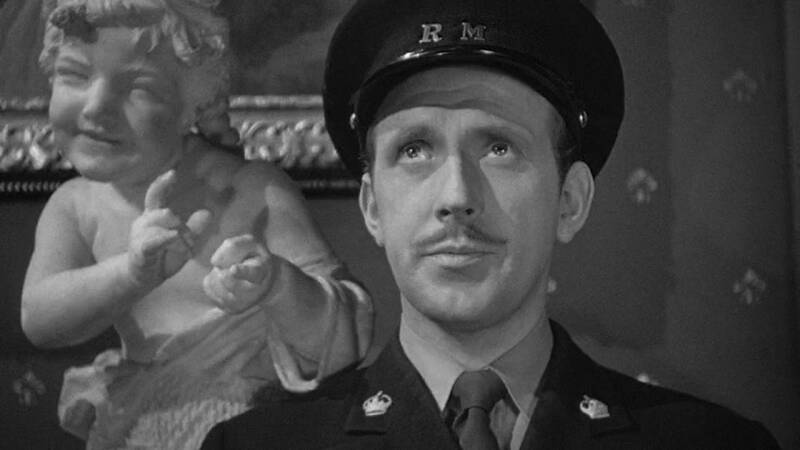 The Pearl of Death is a 1944 Sherlock Holmes film starring Basil Rathbone as Holmes and Nigel Bruce as Dr. Watson, and was the ninth of fourteen films made in this series in which both actors played these roles. The story is loosely based on Conan Doyle’s short story, but a number of features were added, such as Evelyn Ankers as an accomplice of the villain, played by Miles Mander, and Rondo Hatton who acts marvelously as a brutal killer. 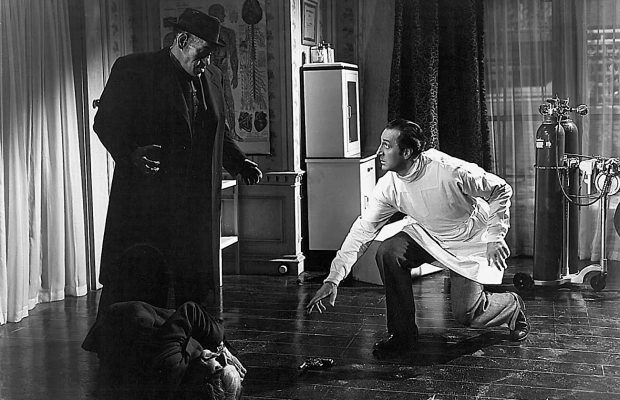 In fact, Hatton did such good job of playing the killer that Universal Studios attempted to capitalize on his portrayal of the Hoxton “Creeper” by casting him in two more (unrelated) films as “The Creeper”: House of Horrors and The Brute Man, both released in 1946 after Hatton’s death. In this film, Sherlock Holmes matches wits with master criminal Giles Conover, who plans to steal the valuable Borgia Pearl right under the nose of Scotland Yard. Assisting Conover is a lovely but dangerous young woman who assumes a series of disguises to throw Holmes off the track. The film is centred on the jewel that has gone missing from a museum, and Sherlock Holmes tries to find the thief as bodies pile up across the city. Holmes is sure that the crime is the work of Giles Conover, and the recent string of murders suggests that the criminal—having stashed the pearl alongside the belongings of an unsuspecting Londoner—has ordered a henchman to find it. With Dr. Watson at his side, Holmes finds himself in mortal danger as he closes in on his man. Many critics who followed this Sherlock Holmes series consider it to be one of the best. As they commented, it was not only entertaining but suspenseful. Watch it and see what you think!